As decent motorbikers we had to boost our equipment before the journey so a robust quality phone mount was the number one on our specs list. We’ve tried many cycling phone mounts with plastic foam side holders (a cheaper version) but after the experience we recommend to spend a few more bucks on the RAM mount that can be seen on the photo. It holds the phone firmly not only in high speeds but also in sharp turns and on bumpy roads! We used Locus Map as offline navigation for the whole trip and as we didn’t want to spend money on Austrian highway ticket, we set Locus Map to navigate along toll free roads only. We got fond of riding local roads so much that we set the toll free navigation on even when traveling back via Germany and Czech republic where motorbikes aren’t charged for highway use. Thus we enjoyed the moto ride much more than if we chose fast (and not much comfortable with our low wind shield), straight and boring highway route. The next day we got off to a hike in the mountains to stretch our limbs stiffen from a long motorcycle ride. Locus Map ways of course with us. We recorded the whole trip with the track recording function. You can check it on the picture below. We recommend this route for the moto as well as the tarmac road is almost parallel to the hiking path. Our bottoms were a bit sore from the previous day so the hike was an obvious choice of the day. 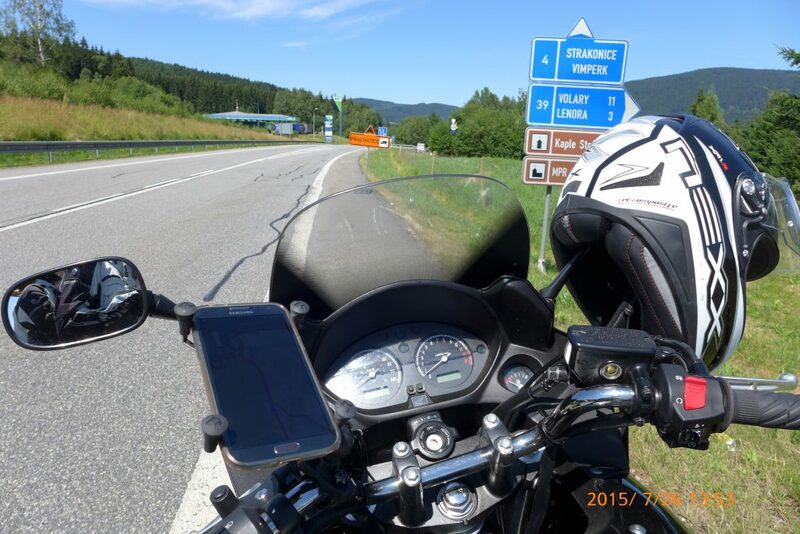 If you’d like to use Locus Map on a motorbike, we strongly recommend touchscreen gloves. We had ordinary gloves without the touchscreen coating which was pretty uncomfortable – we had to put them off every time we wanted to use the phone. The moto touchscreen gloves offer is nothing to write home about – actually, we spied out just one model, leather. We prefer leather-free clothing (and gloves). If you happen to share a tip on good textile touchscreen moto gloves, we’ll appreciate it and all Locus Map moto community as well! Maybe it looks like we’ve just discovered America but we recommend water resistant phone (or at least case) for motor biking. Again, we didn’t have it and according to Murphys laws it started to rain heavily on the third day of our trip. We had opportunity to find out thoroughly that our waterproof riding suits are NOT waterproof and the phone with Locus Map navigation started to misbehave after the first contact with rain drops. The procedure then was following: stop the bike (preferably under a bridge), take the glove off, pull the phone out of the pocket, look where to go on, put it back to pocket, put the glove on, and move on in the downpour. Do you use Locus Map when (motor) biking? Share your experience or your favourite routes that you would like to recommend to other Locus Map users! Hello fom San Diego, I stumbled across locus when searching for an Android app that would allow using offline maps AND that lets me import tracks/routes from Google maps. So far I have used locus only on one group ride yesterday, about 120 Miles in Southern California. The good: I could import the .kmz file the day before and I had it on the phone during the ride. As mentioned in the article above I also had my phone mounted on a RAM mount. The not so good: I had a hard time reading the map. For one it is pretty bright sunlight here and my Samasung S5 had bit of a hard time to compete. The mentioned issue with operation wearing gloves is another for me so far unresolved issue. Taking the glove off to tap the screen is no fun, albeit was necessary only rarely. The last thing is that the route as marked was hard to recognize due to the thin line which I thought can be reconfigured, but I am still looking for how to get this accomplished :-(. All in all I am looking forward to more test rides and I am very close to switching to the full version. thanks for downloading Locus Map. Gloves – special gloves with touchscreen-friendly finger pads are available and recommended. Route thickness – can be reconfigured as you say – best to set the route width for the whole folder where you store your routes. See the manual: http://docs.locusmap.eu/doku.php?id=manual:user_guide:tracks:management. If you have any other questions please contact us best at help.locusmap.eu.